Los Angeles County is quite a county. With a population of about 10 million, it's not only the most populous county in the United States, but it has more people than the entire nation of Sweden. It's home of America's aerospace and entertainment industries. It's home to the two largest ports in the U.S.. Los Angeles County has got it all: Mountains, beaches, deserts, even two islands and 88 incorporated cities. Eighty-eight cities with eighty-eight distinct names (Okay, some of the names are similar). And what's in a name? A glimpse of the town's history, that's what. Many of the cities are named after the original Mexican-era ranchos, or even invented (i.e. gringo) Spanish. One is even in French. Some are named after the native Tongva or Chumash. Another is named after a Native American language from the Midwest. Some are named after saints. Others are named after the town's founders, or their native hometowns. And a few are named after lofty, idyllic visions of what their founders wanted their city to eventually be. Agoura Hills – Misspelling of French Basque settler Pierre Agourre. Arcadia – Named by founder Lucky Baldwin, meaning “utopia” or “paradise,” which originated from the Greek region of Arcadia. Artesia – The artesian wells found in the city. Azusa – Derived from the Tongva village Asuksagna (“Place of the water”). Baldwin Park – Founded by Elias Jackson “Lucky” Baldwin. Bell – Founded by James George Bell. Bell Gardens – Nearby Bell and the farms developed by Japanese gardeners. Bellflower – Anglicized version of the Bellefleur apples that grew in local orchards. Beverly Hills – After Beverly Farms, Massachusetts and the Santa Monica Mountain foothills. Bradbury – Founded by Louis Leonard Bradbury. Burbank – Founded by dentist and land developer Dr. David Burbank. Calabasas – From Spanish word “Calabaza” (pumpkin). Carson – John Manuel Carson, developer and head of Dominguez Water Corporation, grandson of Don Manuel Dominguez. Cerritos – Nearby Rancho Los Cerritos (Spanish for “Little Hills”). Commerce – Chosen in the late 1940s by community leaders to encourage...well...commerce (If they only knew there would be gambling casinos...). Compton – Land pioneer Griffith Dickenson Compton, who donated much of his land to incorporate city. Covina – Named by engineer Fred Eaton (who eventually became Los Angeles Mayor and conceptualized the Los Angeles Aqueduct) after the San Gabriel Mountain valleys, which formed a natural “COVE” around the local “VINE”yards. Cudahy – Founded by Irish immigrant and meat packer Michael Cudahy. Culver City – Founded by real estate developer Harry H. Culver. Diamond Bar – Named by ranch owner Frederick E. Lewis for the "Diamond-Over-A-Bar" cattle branding iron design, which he registered in 1918. Downey – Founded by former California governor John Gately Downey, a land developer. Duarte – After Mexican rancho grantee Corporal Andres Duarte. El Segundo – Invented Spanish for “The second” Standard Oil refinery on the West Coast. Gardena – Invented Spanish reference for area’s reputation as the only dry-season garden/green spot found between Los Angeles and the sea. Glendora – Founder George Whitcomb combined the “glen” (valley) where he lived, with the name of his wife Leadora. Hawaiian Gardens – Named in reference to a bamboo shack refreshment stand that opened in 1927 on Carson and Norwalk boulevards, that was decorated to resemble a Hawaiian garden. Hawthorne – Named by the daughter of town’s co-founder Benjamin Harding; she shared the same birthday with author Nathaniel Hawthorne (OMG, really?!). Hidden Hills – Named by developer A.E. Hanson, who also developed Rolling Hills; location is “hidden” between the San Fernando and Simi valleys. Huntington Park – Founded by Pacific Electric Railway's Henry Huntington. Industry – Named by city boosters to promote industry; incorporated to avoid being annexed by neighboring cities for tax revenue. Inglewood – Named after founder Daniel Freeman’s hometown of Inglewood, Ontario, Canada. Irwindale – A Mr. Irwin who used the town’s first gas-powered water pump to bring a water supply to the community. His daughter’s name was Dale. La Cañada Flintridge – From Mexican-era Rancho La Cañada, and Flintridge, named after developer and former U.S. Senator Frank P. Flint. La Habra Heights – From Mexican-era Rancho La Habra (mountain pass). La Puente – After Rancho La Puente - Old Spanish for “The Bridge” (The Gaspar de Portola Expedition built a bridge over San Jose Creek). Lakewood – Named after the Lakewood Country Club, established 21 years before the city’s incorporation. Lancaster – After Lancaster, Pennsylvania. Lawndale – Named by landowner Charles B. Hopper after Lawndale, Illinois. Long Beach - Named after the “Long Beach Land & Water Company” who bought land and incorporated the name “Long Beach,” a double-reference to the beach's length and Long Beach, New York. Los Angeles - Oh come on, you should know this one already. Lynwood – Named after Lynne Wood Sessions, wife of dairyman and major land owner Charles H. Sessions. Malibu – Derived from Chumash village Humaliwo (“The surf sounds loudly”). Manhattan Beach – Named in 1902 by land developer Stewart Merrill after his hometown of Manhattan, New York; “Beach” was added 25 years later. Maywood – Named after May Wood, woman who worked for the real estate company that owned much of city’s land. Monrovia – Named after founder and rancher, William Norton Monroe. Montebello – Spanish for “Beautiful mountain;” named by William Mulholland who also engineered that city’s water system. Monterey Park – Named after the nearby Monterey Hills, which were named after Pennsylvania’s Monterey Pass, site of a major Civil War battle. Palmdale - Originally named Palmenthal (“palm valley”) by Swiss/German Lutheran settlers who mistook Joshua trees for palms. Palos Verdes Estates – From Mexican-era Rancho de los Palos Verdes (“Ranch of the green sticks” – with “sticks” referring to trees). Pasadena – Chippewa Native American for “Crown Of The Valley,” suggested by settler Dr. Thomas Elliot, who was recommended the name from a missionary friend from the Midwest who worked with Native American tribes. Pico Rivera – Named after Mexican California governor Pio Pico, and the local confluence of the Rio Hondo and San Gabriel rivers. Pomona – Named by horticulturist Solomon Gate, who won a contest to name the town. Named after the Roman goddess of fruit. 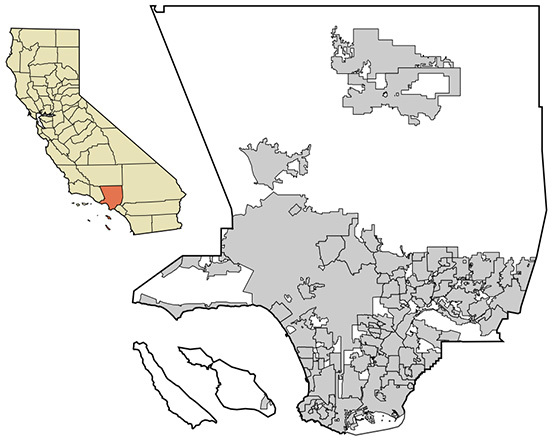 Rancho Palos Verdes – See Palos Verdes Estates. Redondo Beach – Named after Mexican-era Rancho Sausal Redondo (“Round Willow Grove Ranch”), a reference to the round shape of the original rancho property. Rolling Hills – After the rolling Palos Verdes Hills. Rolling Hills Estates – See Rolling Hills. San Dimas – Spanish for St. Dismas, the Biblical figure who was the repentant criminal that was crucified alongside Christ. San Fernando – Named after Mission San Fernando Rey de España (“St. Ferdinand, King of Spain”). San Gabriel – Named after Mission San Gabriel Archangel (“St. Gabriel the Archangel”). San Marino – Named by founder James DeBarth Shorb after his grandfather’s plantation in Maryland, which was named after the small European republic of San Marino, which was named after Saint Marinus, a 4th-century monk. Santa Clarita – Invented Spanish for “Little Santa Clara.” Named after the nearby Santa Clara River, but intentionally differentiated from the northern California city of Santa Clara. Santa Fe Springs – Named after the Atchison, Topeka and Santa Fe Railway which ran through town, and the local artesian springs. Santa Monica – Named by Father Juan Crespi, who, upon arriving at Kuruvugna Springs (at modern-day University High School’s campus), thought the waters reminded him of the tears of Saint Monica. Sierra Madre – Spanish for “mother mountain range,” the original name of the San Gabriel Mountains. Signal Hill – Named after the hill that was traditionally used by the Tongva for smoke signal communication with the island village of Pimugna (Catalina Island). South El Monte – See El Monte. South Gate – Originally named “South Gate Gardens” - a reference to its location on the old Cudahy Ranch. South Pasadena – See Pasadena. Temple City – Founded by land owner Walter P. Temple. Originally named “Temple,” but U.S. Postmaster General wanted to avoid confusion (in the pre-ZIP code era) with Tempe, Arizona. Torrance – Founded by land developer Jared Sydney Torrance. Vernon – Named after Vernon Avenue, which was named after the French town of Vernon. Walnut – Named after Rancho Los Nogales (“Walnut Ranch”). West Covina – See Covina. West Hollywood – Originally named “Sherman” after local electric railway tycoon Moses Sherman, who later called it “West Hollywood” to closely associate it with nearby Hollywood. Westlake Village – Named after Westlake Lake, the westernmost lake (well, reservoir, really) in Los Angeles county (Their city government must have a Department of Redundancy Department). Whittier – Founded by Quaker settlers who named it after their homeboy, poet John Greenleaf Whittier. Commandeered by Militant Angeleno @ 5:14 AM 23 comments: Hyperlinks, yo! Party Like It's 1913: Happy 100th to an Aqueduct, a Museum, a Park! You may or may not have known already that this has been an historic week in Los Angeles history. 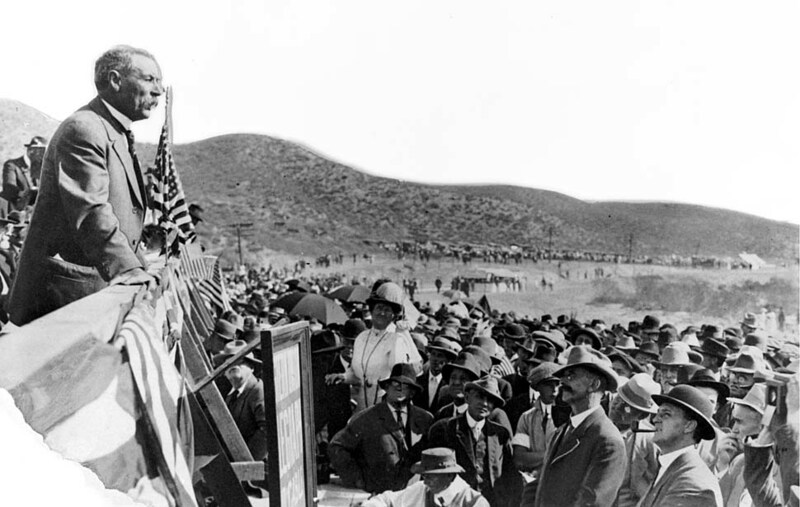 On Tuesday, the Los Angeles Aqueduct celebrated its 100th anniversary, noting the completion of the 238-mile long water transit system from the Eastern Sierras (which The Militant hopes to visit one day soon!) and enabled Los Angeles to grow over 10 times its size in the next century. Today, the Natural History Museum of Los Angeles County (originally called the Los Angeles County Museum of History, Science and Art) and its adjoining Exposition Park (formerly known as Agricultural Park) celebrates their 100th anniversary too, having opened on November 6, 1913. Its opening date right after the Los Angeles Aqueduct was not coincidental at all -- in fact, people who attended the Aqueduct's opening celebration and saw the water arrive were encouraged to visit the museum's opening the next day, and watch the final arrival of the water as it reached the City's water system and created the fountain at the center of the central sunken garden (now today's Rose Garden). What you may or may not have known was that there was an even grander plan to have a neo-Romanesque 100-foot-tall Los Angeles Aqueduct Memorial placed in Exposition Park (pictured left) in 1913, but the plan was too costly, so they settled for a simple fountain. Today, there is also an exhibit on the Aqueduct: Just Add Water, a series of Aqueduct-themed art in watercolor by artist Rob Reynolds, began this week and runs until August 3 of next year. 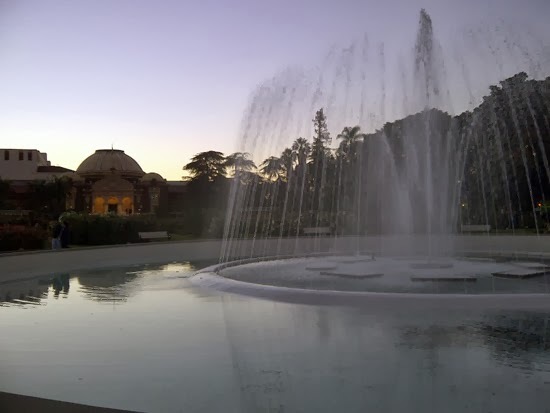 The park was conceived as part of the "City Beautiful Movement" sweeping cities across the U.S. in the early 1900s, where monumental buildings and cultural institutions were established to further promote 20th century urbanism at the time. Many cities like San Francisco and San Diego hosted expositions, and Expo Park, although never having hosted a World's Fair or formal exposition, was part of that trend. Exposition, like today's Grand Park, was re-modeled and re-branded from the old Agricultural Park and opened with the museum, as well as a National Guard Armory and an Exposition Building (which became the California Museum of Science an Industry, now California ScienCenter). The museum has changed and grown over the years; the art component spun-off into its own museum in the early 1960s as LACMA on the county-owned Rancho La Brea property, and the adjacent George C. Page Museum in the 1970s. Today, the Museum still has totally awesome exhibits like Becoming Los Angeles, the Nature Lab and of course the dinos. And Exposition Park is the only park in the country with a stadium that has hosted two Olympics and is home to a freaking Space Shuttle in it! Happy 100th to our Aqueduct, our Natural History Museum and our Exposition Park! Commandeered by Militant Angeleno @ 4:30 PM 4 comments: Hyperlinks, yo!